The deadline for NFL teams to exercise the fifth-year contract options on the 2015 NFL Draft class has come and gone, seeing 12 of the first 32 players selected in 2015 have their fifth-year option declined, or not exercised. With that in mind, we examine those players who were drafted in the first round of the 2015 draft, and are now set to hit free agency next offseason, making 2018 a prove-it year for them and their careers. 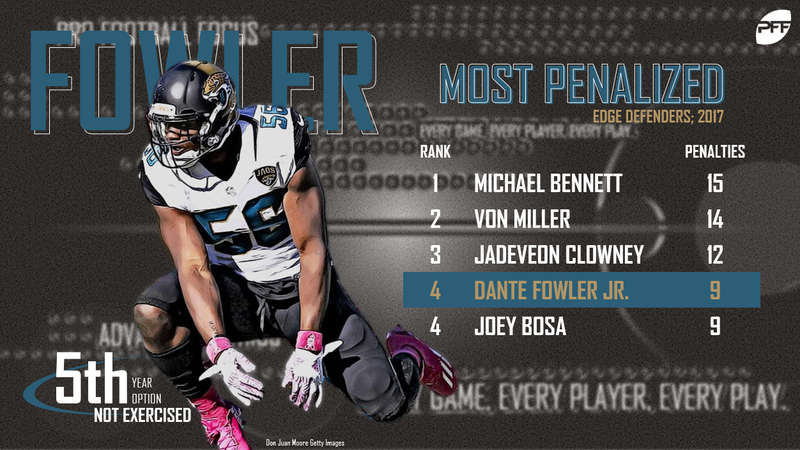 After missing his entire rookie campaign due to an ACL injury sustained in rookie minicamp, Jaguars edge Dante Fowler Jr. simply hasn’t met the lofty expectations tied to the No. 3 overall selection. Playing 1,150 defensive snaps from 2016-17, Fowler has earned sub-54.0 overall grades in each of the past two seasons. However, he has still performed well in bursts as a pass-rusher while working within Jacksonville’s talent-laden defense. After totaling 39 total pressures in 2016, he improved the figure to 46 total pressures and added 21 defensive stops to his stat line in 2017. Fortunately for Fowler, he’s proven to have the skillset necessary to produce at the NFL level. The concern lies in his consistency, which could be improved as he continues to gain experience. Injuries have plagued Bears wide receiver Kevin White’s career, and that may even be an understatement. Shin splints cost him his entire rookie season, a fractured fibula put him on the shelf after Week 4 in 2016 and, most recently, he was placed on the Injured Reserve after fracturing his scapula in Week 1 in 2017. And, fortifying the “bad luck” narrative, he played in 93.2 percent of his team’s offensive snaps in his one year we have college grading for (2014) at West Virginia. At 6-foot-3, 216 pounds, White has the size, speed and athleticism to make a difference in Chicago if he can do away with the injury bug that has adamantly taunted him throughout his career. With the Mountaineers, he ranked T-11th in yards per route run (2.59) and 17th in passer rating when targeted (104.3) among the 2015 draft class. Of course, if White is going to turn back the clocks on his football career, it starts and ends with him getting healthy. 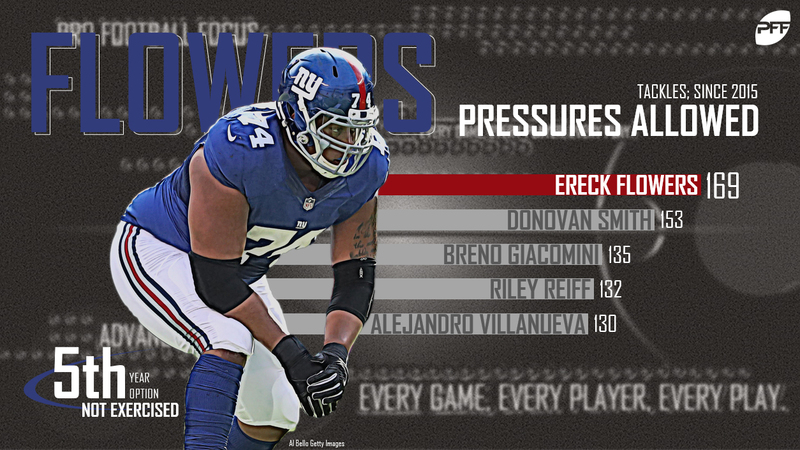 Giants tackle Ereck Flowers, though rumored to be on the trade block in recent weeks, remains in the Big Apple – for now. Without the fifth-year option tagged to the back end of his rookie deal, Flowers has just the 2018 season to flip the script on his NFL career before having to negotiate another contract with his new agent Drew Rosenhaus. In three years, he has allowed 134 total pressures across 1,819 pass-block snaps, and he’s failed to earn an overall season grade above 51.5 in the process. Flowers has, however, improved every year he’s been in the NFL, earning career highs in terms of overall grade (51.5) and pressures allowed (41) in 2017. Additionally, after ranking outside the top-50 qualifying offensive tackles in pass-blocking efficiency in 2015 and 2016, Flowers ranked 31st at 94.8 this past season. 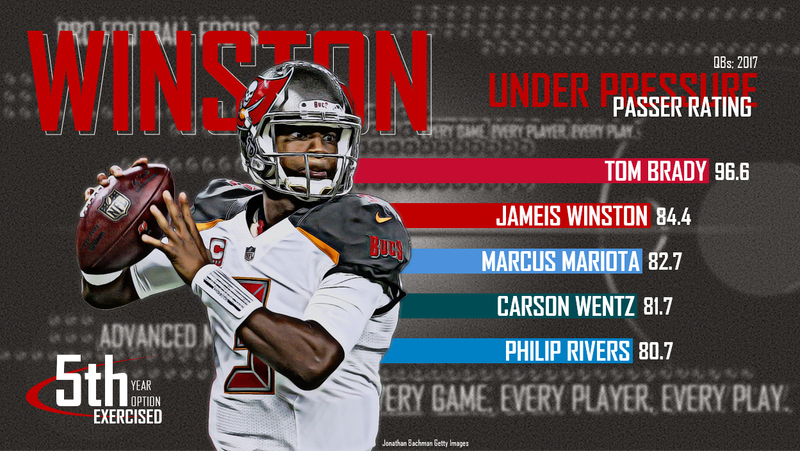 If he can continue his upward trend at a bit steeper ascent in 2018, he’ll be in much better shape come free agency in 2019. 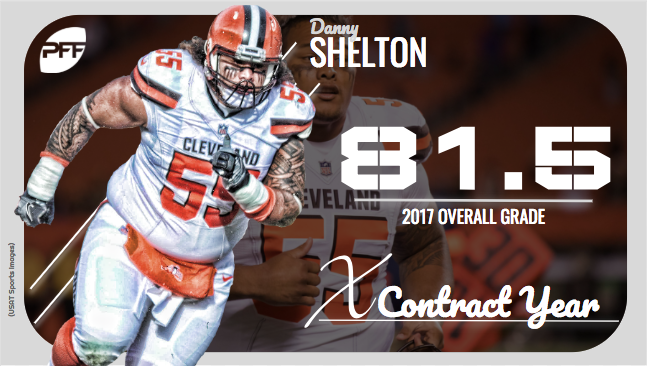 Traded to New England in early March, former Washington standout and Cleveland Browns first-round pick Danny Shelton, a one-dimensional interior defender favoring run defense, will be vying for his second NFL contract in his first year in Foxborough. While his consistent, high-end play against the run will set a reasonable interest level from teams following his 2018 campaign, Shelton will need to improve as a pass-rusher to keep pace with what is continuing to grow as a pass-heavy league. Despite recording 47 total pressures in his final year with the Huskies in 2014, Shelton has yet to produce at a similar rate when attacking the passer on Sundays. He recorded just 30 total pressures, including 25 hurries, three QB hits and two sacks, in his three years in Cleveland. And in 2017, he earned the 88th-ranked pass-rush grade (53.2) among qualifying interior defenders. Former Florida State offensive lineman Cameron Erving underwhelmed in his first two years in the league after going to the Browns 19th overall in the 2015 NFL Draft, ultimately pushing the Browns’ brass to ship him off to the Kansas City Chiefs for a fifth-round pick prior to the 2017 season. However, though coveted for his positional versatility, Erving’s development has likely been slowed due to his participation in what has been the offensive line version of musical chairs. In 2015, Erving played 194 snaps at left guard and another 216 at right guard, nearly splitting his rookie campaign in half in terms of position experience. Then, under the tutelage of an entirely new coaching staff, he was cast at center to the tune of 659 offensive snaps the following year, earning a 36.8 overall grade in the process. Trading Cleveland for Kansas City in 2017, he battled injuries (MCL, calf) in addition to the change of scenery while taking the field at right guard (193 offensive snaps) and left tackle (63 offensive snaps). As expected, Erving’s three-year grades have suffered in part to his inconsistent placement along the offensive line, as he has earned sub-42.0 overall grades from 2015-17. He’s also allowed a whopping 72 total pressures in his career. Perhaps, if given the opportunity to stay in one spot and get healthy, Erving can turn his career around for the better, an upswing he’ll need to pull off if he’s to ink a deal in 2019. Though originally drafted to develop behind then-marquee bookends Andrew Whitworth and Andre Smith in 2015, former Texas A&M offensive tackle Cedric Ogbuehi has failed to turn his proverbial ‘redshirt year’ into positive results. The 6-foot-5, 310-pound Ogbuehi has ideal measurables for the tackle position, but his technique has failed to follow suit. 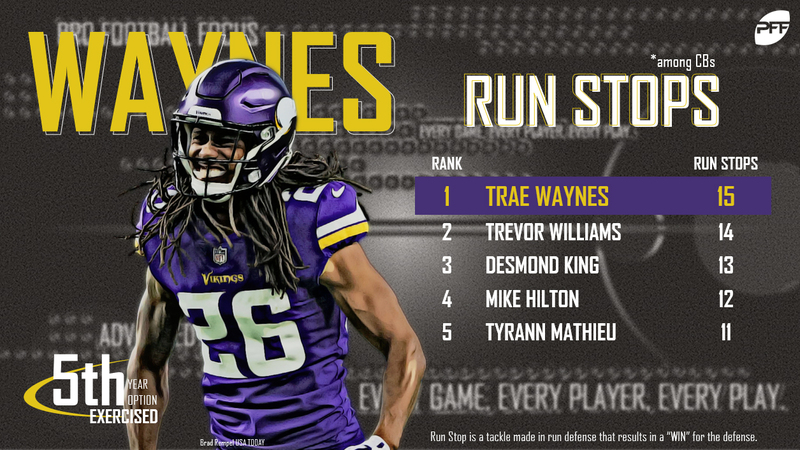 He has earned sub-45.0 overall grades in each of the past two seasons. He also ranked among bottom-10 qualifying offensive tackles in pass-blocking efficiency both years, allowing 78 total pressures across 788 pass-block snaps. With former Buffalo Bills offensive tackle Cordy Glenn inserted into the picture, it’s unlikely Ogbuehi is given the opportunity to correct his play as the team’s starter if he can’t beat out Eric Fisher for nod at right tackle, meaning all of his improvement may need to come as a reserve tackle on limited snaps. After drafting the probable future of the team’s pass-rush with NC State’s Bradley Chubb, the Denver Broncos have decided against exercising edge defender Shane Ray’s fifth-year option, tightening his window to prove he’s worth a lucrative extension. Ray’s first order of business in 2018 will be to prove valuable enough to steal snaps away from Chubb and veteran Shaquil Barrett. Our second-ranked edge defender in the 2018 draft class, Chubb proved dominant in his pursuit of the quarterback at the collegiate level, as evidenced by his 85.5 pass-rush grade in 2017. Barrett, though much better against the run, also has provided value as a pass-rusher, recording a career-high 43 total pressures this past season. If Ray is going to step in front of the aforementioned duo, he’ll need to mirror his 2016 play more so than his efforts in 2017. A clear step above his sub-51.0 overall grades in 2015 and 2017, he earned career-highs in overall grade (76.7), total pressures (45) and defensive stops (25) as a sophomore in 2016. In addition to sustaining significant injuries, former UCF wide receiver Breshad Perriman has struggled to work his way up the Baltimore Ravens’ depth chart and put forth high-end production when healthy, giving the team’s front office little reason to exercise his fifth-year option. After missing his entire rookie season with a torn PCL, Perriman stumbled out of the gate during his second year, earning a 56.4 overall grade across 486 offensive snaps. And rather than improving in 2017, Perriman dropped further down the ranks, as he finished dead last in terms of overall grade (39.1) among the 116 qualifying wide receivers. Targeting Perriman, Ravens quarterbacks earned a 14.6 passer rating, which ranked last among wide receivers with at least 15 targets a year ago, and he dropped 4-of-14 catchable targets. Unfortunately for Perriman, targets in the Ravens’ offense will come at a premium in 2018, as Baltimore’s front office added Willie Snead, Michael Crabtree and two Day 3 pass-catchers in Jordan Lasley and Jaleel Scott to the roster this offseason. Perriman will need to put the inefficiencies in his game behind him to best his competition in camp and place confidence in the coaching staff to earn much-needed opportunities. Former Lions first-rounder Laken Tomlinson struggled to meet expectations as the team’s starter at left guard in Years 1 & 2 of his career in the Motor City, earning sub-50.0 overall grades in both seasons (2015-16). Detroit’s front office was quick to cut the cord, sending Tomlinson to the San Francisco 49ers for just a 2019 fifth-round pick in late August 2017. And fortunately for Tomlinson, the change in scenery has allowed him to bounce back. Tomlinson earned a 70.7 overall grade across 1,042 offensive snaps in his first year with San Francisco, specifically excelling in the run game. In addition to his 76.2 run-block grade, he ranked 11th among guards with 400-plus offensive snaps last season in run-block success percentage at 15.0 percent. While his pass protection must improve, Tomlinson is in a good position to continue his upward trend in Kyle Shanahan’s offensive system. Coveted as a true burner that could stretch the defense coming out of Miami (Fla.), Phillip Dorsett faced a steep learning curve when asked to expand his route tree, causing him to fall out of favor with the Indianapolis Colts just two years into his NFL career. Heading into Year 2 now with the Patriots, Dorsett’s versatility as a route runner must improve to warrant a spike in production in what has been a limited career. As a rookie in 2015, Dorsett ran either crossing routes or ‘go’ routes on 44.4 percent of his 36 targets, and when Indianapolis’ coaching staff pushed him to branch out as a sophomore in the NFL, the results weren’t favorable. He saw a 42.0 percent increase in targets on hitches and in routes in 2016, but his passer rating when targeted on the two routes fell 40.3 and 19.1 points below the league average, respectively. He also earned a career-low 45.2 overall grade in the same season. Dorsett was able to return to his comfort zone in New England, as crossing routes or ‘go’ routes accounted for 45.0 percent of his 20 targets. Of course, as previously mentioned, success in this league only comes outside of his comfort zone. Dealt to the Miami prior to the start of the 2017 season, former New Orleans Saints first-round pick Stephone Anthony has yet to reclaim a significant role on defense since his lackluster rookie campaign. The 6-foot-3, 245-pound linebacker will need to recover from injuries and a disappointing career to date in order to effectively rebound in 2018. Despite leading the team in tackles (105), Anthony struggled with efficiency both in coverage and against the run in 2015. He recorded a 135.5 passer rating when targeted, ranking 90th among linebackers with at least 315 defensive snaps in 2015. And he tied for 31st in run-stop percentage (8.2) among off-ball linebackers with at least 127 run-defense snaps. Anthony has since been cast into a reserve role, going from 1,002 defensive snaps as a rookie to just a combined 263 over the past two seasons (2016-17). Though Miami’s roster hosts significant potential at the linebacker (i.e. Raekwon McMillan, Jerome Baker), he won’t have a choice but to best the other youngsters for a larger snap count in 2018 if he is to take his game to the next level. 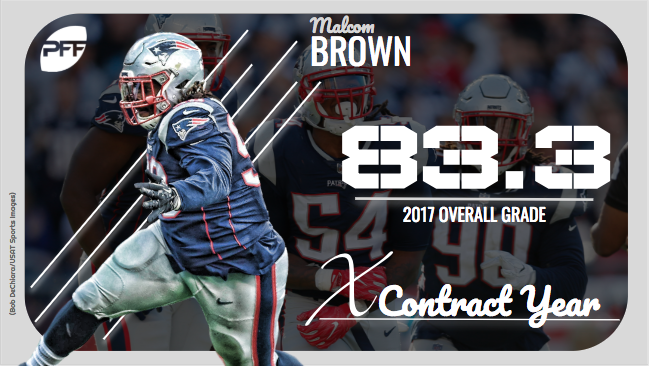 Of all the 2015 first-rounders playing in contract years in 2018, Patriots interior defender Malcom Brown has been both the most consistent and most successful transitioning from the college ranks to the NFL. The former Texas star has earned 75.5-plus overall grades while playing at least 600 defensive snaps in all three years of his career, including a career-high 83.3 overall grade in 2017. Among 4-3 defensive tackles with at least 172 run-defense snaps this past season, Brown ranked fourth in run-stop percentage at 11.1. He also earned the 15th-ranked run-defense grade (88.6) among all interior defenders for his efforts in 2017. Similar to Shelton, Brown’s limitations as an interior pass-rusher likely kept New England from exercising his fifth-year option, as he’s failed to amass more than 28 total pressures in any single season of his career. 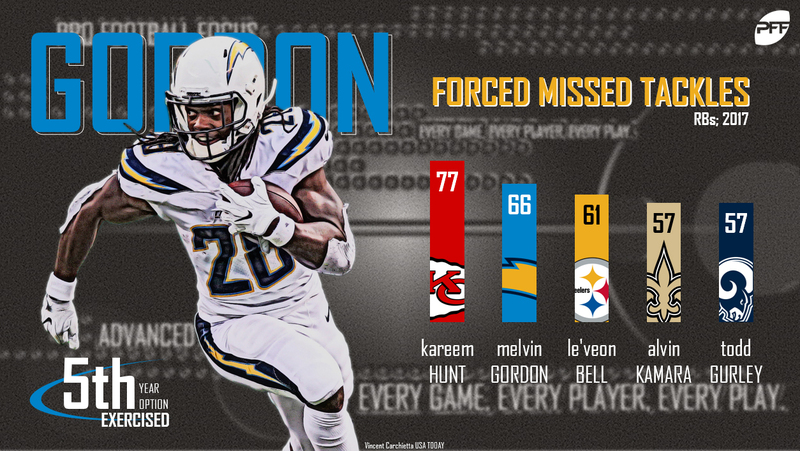 If Brown is going to become a household name, regardless of where he plays in 2019, he’ll need impact the passing game at a higher rate.